Breakdance (media coined phrase), also known as breaking, b-girling or b-boying, is a street dance style that evolved as part of the hip hop movement that originated among African American and Latin American youths in the South Bronx of New York City during the early 1970s. It is arguably the best known of all hip hop dance styles. A breakdancer is also known as a breaker, and B-boy. Popular speculations of the early 1980s suggest that breakdancing, in its organized fashion seen today, began as a method for rival gangs of the ghetto to mediate and settle territorial disputes. In a turn-based showcase of dance routines, the winning side was determined by the dancer(s) who could outperform the other by displaying a set of more complicated and innovative moves. It later was through the highly energetic performances of the late funk legend James Brown and the rapid growth of dance teams, like the Rock Steady Crew of New York City, that the competitive ritual of gang warfare evolved into a pop-culture phenomenon receiving massive media attention. Parties, disco clubs, talent shows, and other public events became typical locations for breakdancers, including gang members for whom dancing served as a positive diversion from the threats of city life. Though its intense popularity eventually faded in the 1980s, breakdancing persists as a mainstream phenomenon, maintaining exposure through often comical portrayals in commercials, movies, and the media. Breakdancing remains an enjoyable pastime for enthusiasts and, for a few, a serious competitive dance where annual exhibitions and competitions of all levels take place. A basic routine might include toprock, a transition into downrock, also known as footwork, a display of power moves, and finally a climactic freeze or suicide. Toprock refers to any string of steps performed from a standing position, relying upon a mixture of coordination, flexibility, style, and most importantly, rhythm. It is usually the first and foremost opening display of style, and it serves as a warm-up for transitions into more acrobatic maneuvers. In contrast, downrock includes all footwork performed on the floor as in the 6-step. Downrock is normally performed with the hands and feet on the floor. In downrock, the breakdancer displays his or her proficiency with foot speed and control by performing footwork combinations. These combinations usually transition into more athletic moves known as power moves. Power moves refer to moves that require momentum and physical power to execute. In power moves, the breakdancer relies more on upper body strength to dance, using his or her hands to do moves. Power moves include windmill, swipes, headspins, flare, and airflare. Because power moves are physically demanding, breakdancers use them as a display of upper body strength and stamina. Many moves are borrowed from gymnastics, such as the flare, and martial arts, with impressive acrobatics such as the butterfly kick. The more difficult freezes require the breakdancer to suspend himself or herself off the ground using upper body strength, in poses such as the handstand or pike. Whereas freezing refers to a single pose, locking entails sharp transitions between a series of freezes. Suicides are another type of move to end to a routine. Breakers will make it appear that they have lost control and fall onto their backs, stomachs, etc. The more painful the Suicide appears, the more impressive it is, but breakdancers execute them in a way to minimize pain. In contrast to Freezes, Suicides draw attention to the motion of falling or losing control, while Freezes draw attention to the final position. 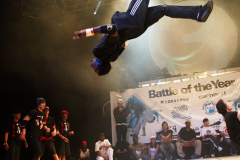 “Battles” refer to any level of competition in which breakdancers in an open space (typically a circle or square) participate in quick-paced, turn-based routines, whether improvised or planned. 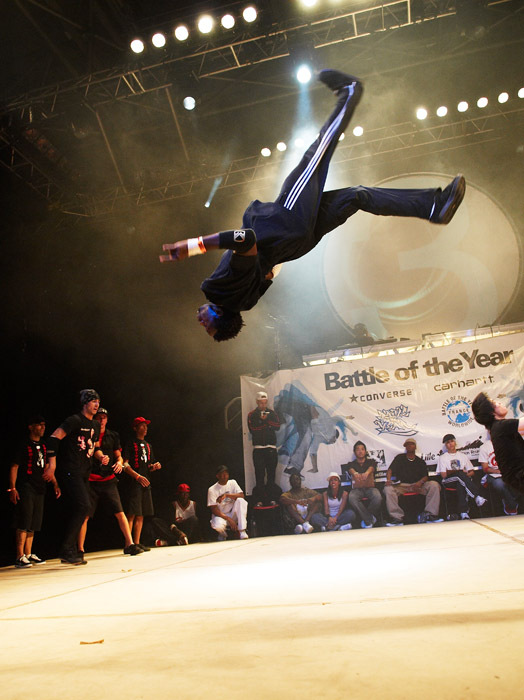 Participants vary in number, ranging from head-to-head duels to battles of opposing breakdance crews, or teams. Winners are determined by the side exhibiting the most proficient combinations of moves. “Cyphers,” on the other hand, are open-forum, mock exhibitions where competition is less emphasized. Since its inception, breakdancing has provided a youth culture constructive alternative to violent urban street gangs. Today, breakdancing culture is a remarkable discipline somewhere in-between those of dancers and athletes. Since acceptance and involvement centers on dance skills, breakdancing culture is usually free of the common race, gender and age boundaries of a subculture and has been accepted worldwide. Social interaction centers on practice and performance, which are occasionally intertwined because of its improvisational style. While featured at dance schools, breakdancing is very difficult, typically taught to newbies, or beginners, by more experienced breakdancers and passed on to new generations by informal word-of-mouth. Clubs and hip-hop schools do exist, but are rare in number and more so in organization. 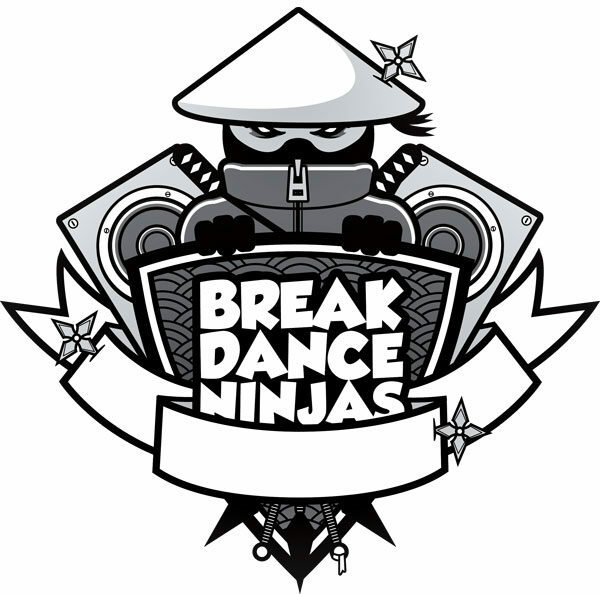 As the clichéd quote “break to the beat” insists, music is a staple ingredient for breakdancing. The original songs that popularized the dance form borrow significantly from progressive genres of jazz, soul, funk, electro or electro funk, disco, and R&B. (See 1970s and 1980s). The most common feature of breakdance music exists in breaks, or compilations formed from samples taken from different songs which are then looped and chained together by the DJ. The tempo generally ranges between 110 and 135 beats-per-minute with shuffled sixteenth and quarter beats in the percussive pattern. History credits Kool DJ Herc for the invention of this concept, later termed breakbeat. The musical selection is not restricted to hip-hop as long as the tempo and beat pattern conditions are met. It can be readily adapted to different music genres (often with the aid of remixing). World competitions have seen the unexpected progressions and applications of heavily European electronica, and even opera. BBOY History was copied from Wikipedia, because they did an excellent job!